Cooking is registered in the system of people. Everyone loves to cook. It became part of their everyday lives with variety of purposes; for self-discovery, for self-benefits, for catering, and for experimentations. Surely, there are more purposes, a person has, aside from the things mentioned but did you ever think that you already know everything or at least a lot about cooking? We may say that we know how to cook, but needless to say, our skills are limited when it comes to preparation of them. Hence, an active institution, TESDA, is here to help us fill the gaps of our incompleteness when it comes to preparing food and beverages in commercial settings such as restaurant, hotel, or bar. In our generation today, free stuffs are difficult to seek, and in your business, you wouldn’t want your customers to take you for granted just because you are not knowledgeable about the portioning of each serving. 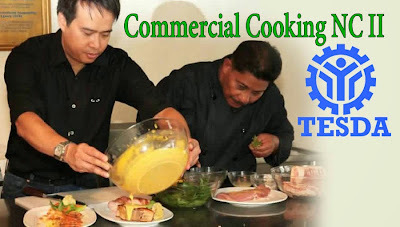 Therefore, in this course, we offer trainings on how to cook, prepare and serve food that are listed in the menu with proper portioning or weighing meat cuts, food presentation procedure, receiving kitchen supply, food recipe preparation and most importantly good customer service techniques and process. Learning all this under the Commercial Cooking NC II will probably take 436 hours to accomplish. It takes time to really master our cooking skills but the time allotted is definite and just for us to cope with what we lack. As a trainee, of course, you need to submit some basic and fixed requirements. These are: Certification of Birth authenticated by NSO; High School or College Diploma; Police Clearance; Barangay Clearance; Certificate of Good Moral Character and of course, 1x1 and/or 2x2 Pictures. Upon completing the said course, you may be able to apply as a Restaurant cook. By the time you’re already working, you will learn variety of stuffs like the rules and guidelines to keep your profile clean. This is to avoid unwanted or negative feedbacks from your customers to keep your business running.